In addition to viewing the afternoon solar eclipse, ALE students in Donald Hunt’s BMS science classes created a 100-foot replica of the Solar System, drawing and naming the Sun and the nine planets that revolve around it. Prior to students throughout the nation participating in last week’s solar eclipse, Donald Hunt wanted the individuals in his science classroom to have an idea of just how massive the Solar System is that includes Earth, so he and his students ventured outdoors for some hands-on learning. The pavement behind his classroom and just to the north of Haley Field still was way too small for the solar system, but it helped Hunt explain just how huge and expansive the system that encompasses all the planets and stars is. 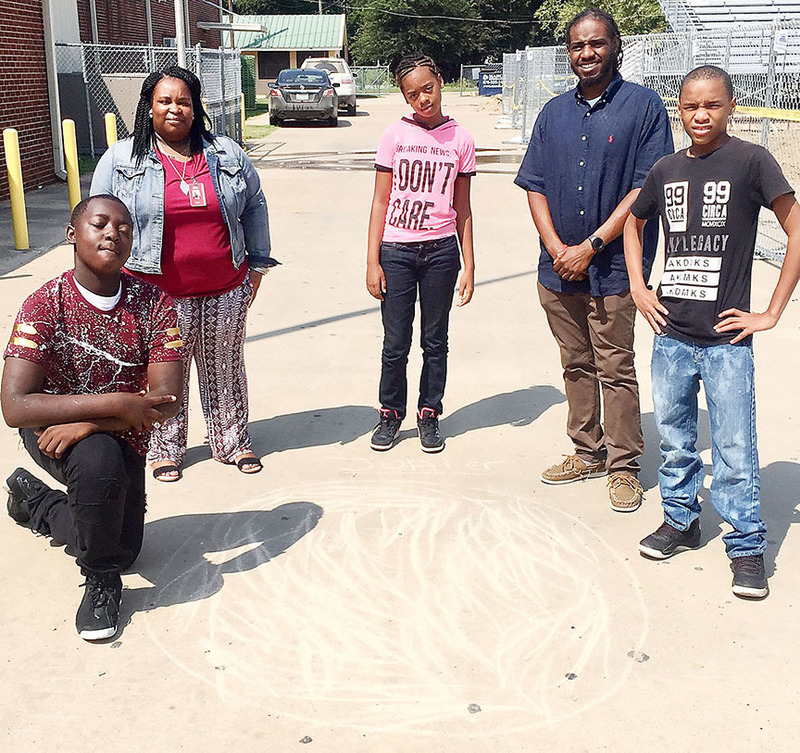 Hunt, science teacher at Blytheville Middle School, and his students drew a 100-foot scale model of the Solar System, using chalk to draw and then name each of the planets, from Mercury to Pluto. The principal component of the Solar System is the Sun, with each of the nine planets revolving around it. The size of the Solar System is approximately 7.5 billion miles, or about three times further than Pluto, which is about 40 astronomical units from the Sun. One astronomical unit is 93 million miles, or the distance between Earth and the Sun. Hunt also used a flashlight, miniature globe and miniature moon to help his students learn the different ellipses, which are paths that the planets follow as they orbit the earth. Students in the fourth-12th grades who were allowed by their parents to view the solar eclipse went out early in the afternoon, using NASA-approved filtered sunglasses to look at the Sun. Students in kindergarten-third grade watched live feeds on television because administrators believed they could not stop all the students from looking up into the sun and incurring possible damage to their vision. Hunt taught the students the difference between a solar eclipse and a lunar eclipse. He said the solar eclipse, which is what all persons experienced Aug. 21, is when the moon passes between the Sun and the Earth, fully or partially blocking the Sun; a lunar eclipse occurs when the Sun, Earth and Moon are aligned exactly, or very closely so, with the Earth in the middle. Hunt explained the difference in the umbra, or the darkest part of the shadow, and the penumbra, or where some or all of the light source is obscured. Hunt is just one example of a variety of learning opportunities that the solar eclipse provided for students across the district as teachers in every building took advantage of the relevance of the topic and engagement the students had in the event, said Sally Cooke, the Blytheville School district’s director of Curriculum.